Length: 5-7 mm. As with many other troglodyte (deep cave dwelling) species, this amphipod is translucent, without pigment and completely blind. 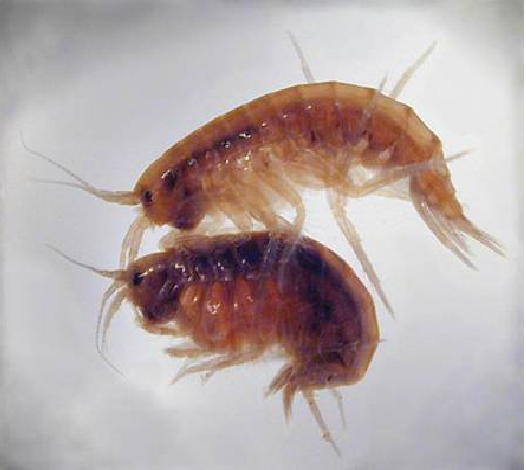 The Quatsino species is typical of amphipods, with a body composed of 13 segments which can roughly be grouped into the head, pereon (thorax) and pleon (abdomen). The legs and antennae are of various lengths with numerous sensory hair-like structures. The longer antenna of both sexes equals approximately 50% of the body length. Males are similar to females except the frontal section of the gnathopod (claw like structures used for grasping and feeding) of the males are larger. Females carry eggs in a ventral brood pouch formed by projections in the first segment of the first five of seven legs. Juveniles hatch as miniatures of adults. Elevations: 100-800 m. While there are a number of representatives of this genus in North America, in BC this species is presently only known from the following underground streams flowing through karst cave systems on Vancouver Island: Artlish Caves (north of Zeballos), Hollow Cave southeast of Port Alice, Thanksgiving Cave (near Tahsis), Euclataws Cave (near Horne Lake), Hanging Sump Cave (near Nimpkish Lake), Tsulton River Rising (Port McNeill) and Hourglass Cave (near Lake Cowichan). This species has also been discovered in disjunct populations to the north in the outer portion of the Alexander Archipelago of southeast Alaska (Dall, Coronation, Heceta and Sumez Islands). Known distribution restricted to coastal islands may be the result of communities of cave-adapted fauna remaining stable through periods of glacial coverage, and after glaciers receded. This species is associated with underground streams and pools flowing through unique landscape systems known as karst. These systems are a result of water percolating through carbonate bedrock (limestone, marble or dolomite), creating underground cave and stream networks. The amphipod uses the subsurface flows to disperse through the labyrinth of openings in the karst system. Water temperature is typically low (3.0 to 8.5°C) with a somewhat alkaline pH (~7.5-8.0) with low nutrient availability other than materials which flow in from surficial areas. Karst systems are often evident only from small streams flowing in and out of mossy covered openings, or sinkholes in the forest floor. Some form extensive exposed crevice or cave structures. Well-developed karst occurs typically in regions with high precipitation and rough terrain overlain with surface vegetation communities of old growth or mature coniferous forest with dense understory communities of epiphytic species (mosses, lichens, liverworts). Caves tend to have low nutrient loading and lowered productivity which limits food resources. Quatsino cave amphipod feed on by scavenging on organic matter or other organisms which wash through and settle in the underground aquatic environments they utilize. Actual spawning cycle is unknown, young hatch from eggs stored in brood pouch in thorax of female. There is no apparent larval stage, hatchlings are identical to adults, increasing in size gradually through direct growth. Small population size, limited distribution in BC (and globally), as well as narrow threshold tolerances for pH reduce the ability for this species to easily colonize or recolonize sites and make it. This species is not thought to be mobile over large distances, natural drift colonization is reduced by flow and terrain barriers further increasing extirpation risk. Human disturbance including direct mortality and damage to aquatic environments from recreational caving activities. Alterations to hydrology and water quality regimes from forestry, road construction and other development or extractive activities. Sedimentation and infilling of caves and other connected cavities from surficial soil erosion, sub-surface slides and cave collapse due to surface clearing activities. Please apply conservation goals and objectives as set out in the Accounts and Measures for Managing Identified Wildlife – Accounts V.2 Quatsino Cave Amphipod Stygobromus quatsinensis . Apply best practices, inventory guidelines and approaches to identify and protect karst features and terrain as set out through the Provincial Forest Practices Branch Karst Management Handbook for BC and the Karst Inventory Standards and Vulnerability Assessment Procedures for BC. This species is Identified wildlife under the Forest and Range Practices Act and is subject to protections and prohibitions under the BC Wildlife Act. Habitat for this species is also governed under other provincial and federal regulations including the Fish Protection Act and Federal Fisheries Act and potentially Regional and local municipal bylaws. Alaska Department of Fish and Game. 2006. Our Wealth Maintained: A Strategy for Conserving Alaska’s Diverse Wildlife and Fish Resources. Alaska Department of Fish and Game, Juneau, Alaska. Xviii=824 p. - B.C. Conservation Data Centre. [Internet] . Species Summary: Stygobromus quatsinensis. BC. Ministry of Environment and BC Ministry of Forests and Range [Internet] [Updated January 25 2006]. Forests Practices Branch, Karst and Caves. - Carlson K. R. 1997. The distribution of troglobitic and troglophilic invertebrates in southeast Alaska. Proceedings of the 1997 Karst and Cave Management Symposium/13th National Cave Management Symposium, October 7-10. Bellingham, ashington. Pp. 28-33. - Holsinger, J.R. and D.P. Shaw. 1987. Stygobromus quatsinensis, a new amphipod crustacean (Crangonyctidae) from caves on Vancouver Island, British Columbia, with remarks on zoogeographic relationships. Can. J. Zool. 65:2202–2209. - Holsinger, John R. et al. 1997. 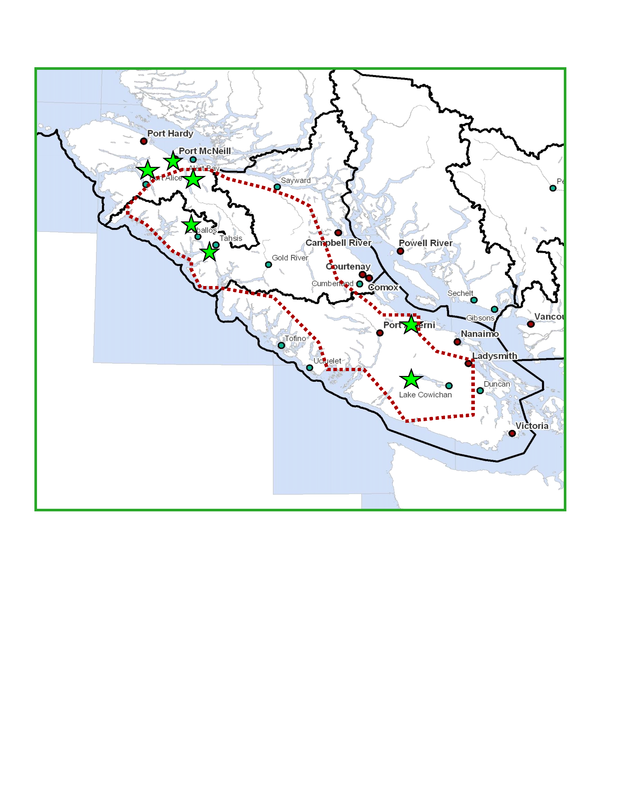 Biogeographic Significance of Recently Discovered Amphipod Crustaceans (Stygobromus) in Caves of Southeastern Alaska and Vancouver Island. Proceedings of the 12th International Congress of Speleology, 1997. Switzerland. Vol. 3. - Proulx, Gilbert et al. 2003. A Field Guide to Species at Risk in the Coast Forest Region of British Columbia. Published by International Forest Products and BC Ministry of Environment. Victoria (BC). - Shaw, Patrick. 2004. [Internet]. Accounts and Measures for Managing Identified Wildlife. Accounts V. Quatsino Cave Amphipod Stygobromus quatsinensis - Stokes, Tim et al. 2010. [ Internet] [Updated July 21 2010]. Compendium of Forest Hydrology and Geomorphology in British Columbia. Chapter 11 – Karst Geomorphology, Hydrology, and Management. FORREX Forum for Research and Extension in Natural Resources. Species Profile prepared by: Pamela Zevit and Paul Griffiths for the South Coast Conservation Program (SCCP) in partnership with: International Forest Products (Interfor), Capacity Forestry (CapFor) and Species at Risk & Local Government: A Primer for BC. Original funding for this project was made possible through the Sustainable Forestry Initiative (SFI): http://www.sfiprogram.org/ Updated and revised by: Isabelle Houde, RPBio in consultation with the SCCP. Part of the National Conservation Plan, this project was undertaken with the financial support of the Government of Canada. Dans le cadre du Plan de Conservation National, ce projet a été réalisé avec l’appui financier du Gouvernement du Canada. Every effort has been made to ensure content accuracy. Comments or corrections should be directed to the South Coast Conservation Program: info@sccp.ca. Content updated March 2015. Image Credits: Quatsino Cave Amphipod: Paul Griffiths, Gammarus lacustris: Stan Eisen (Christian Brothers University, Memphis TN), Habitat: BC Ministry of Forests and Range. Only images sourced from “creative commons” sources (e.g. Wikipedia, Flickr, U.S. Government) can be used without permission and for non-commercial purposes only. All other images have been contributed for use by the SCCP and its partners/funders only.